With his latest video, the RUST Star Bunker Base Design, our partner xRaW walks us through a unique RUST base design for 2019. This bunker base design features a full 360-degree shooting floor with a unique, star-shaped footprint. In addition, you’ll find a vault mechanism that is used to secure the tool cupboard and sensitive loot. It also contains a hard to raid tool cupboard, with compact item placements throughout, ample storage boxes and advanced anti-raid mechanics such as un-drainable shotgun traps. The base altogether requires more than 150 satchels to raid directly to the tool cupboard and over 200+ for an indirect path. Another thing that makes this base extra special is that it’s designed as a starter-to-main base, allowing you to build it in stages as the resources and blueprints become available. 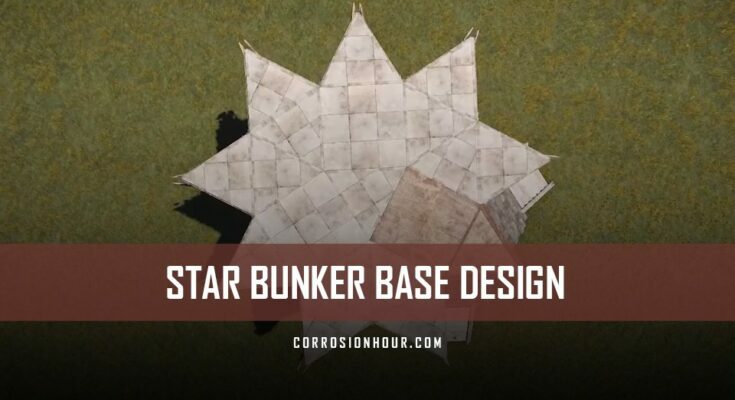 Hey guys and welcome back to another video, in today’s video we’re going to be looking at a rust base design called “the star bunker”, similar to my recent bunker bases, but with a full 360 shooting floor. Coming over to the base here we have the roofs to get up to the doors, followed by an airlock that leads to a full 360 shooting floor with plenty of space and windows to allow for base defense. We have garage doors here, but you can use double doors – just to secure the floor. Back into the airlock here, you can access the entrance to base – this is a mirror image allowing access to the base from both sides. We have space for some drop boxes here, as well as traps for base defense. Again, the entrance in this base is blocked by 3 interlocking roof pieces, invulnerable to incendiary rockets, and increasing the raid cost massively. To remove the bunker method, you need to destroy the twig floors as I show here, this removes the stability holding the roofs and lets you gain access as normal. The shotgun traps you see here are placed so that they are un-drainable, preventing raiders from getting past this stage. In here is the starter section of your base, you have your tool cupboard hidden behind 2 reinforced window glass, your research bench, workbench, 9 large boxes, 5 small box, 5 furnaces and your sleeping bag, with plenty of space to get around making this base suitable for solos / duos / trios or small groups. Due to the distance from the top, incendiary rockets will not destroy this I do a number of base building guides on my channel so feel free to check those out! This base is going to cost you 27.1k stone, 6.5k wood, and 8k metal, you can use HQM for the core but it’ll be more expensive! The upkeep is 2.5k metal, 5k stone and 500 wood!